I never thought that a survival/horror title would be among the greatest games I’d ever played, but after experiencing (because “playing” just doesn’t seem to apply) The Last of Us, it’s hard to remember a game I’ve liked more. Strangely, even the word “liked” seems out of place, because the kind of enjoyment Naughty Dog presents here is akin to reading a really good Stephen King novel; there’s nothing inherently “fun” about the dark material, but you press onward anyway because you are unequivocally hooked from page one. Set in a post-pandemic world in which cities have been transformed into military-controlled Quarantine Zones to protect citizens from flesh-eating, infected humans, The Last of Us introduces its players to protagonists Joel and Ellie. Joel, a late-forties smuggler with an “it’s-me-or-them” sense of morality takes on a contract to transport Ellie, a headstrong 14-year-old girl with no experience outside of the city’s walls, to another Quarantine Zone. As you might guess, this journey is far from easy. In escaping from the Zone and making their way into the untamed wilderness, the duo encounter trigger-happy soldiers, ruthlessly violent bandits, and–of course–the bloodthirsty Infected, from whom one bite initiates the rapid “turning” process. 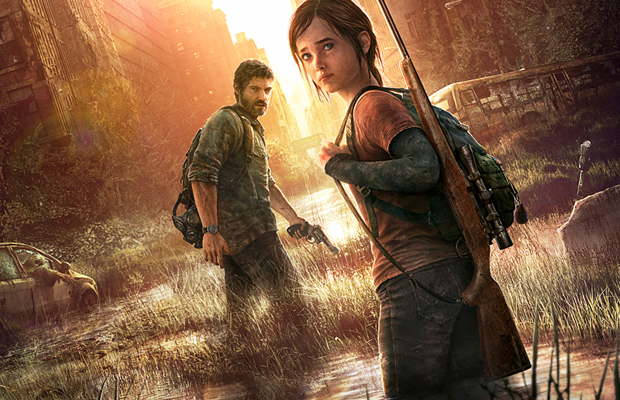 Naughty Dog has proven time and again that it knows its way around a story, but with the lighthearted elements incorporated into most of its outings, it was hard to imagine the developer crafting a narrative with such a serious focus, as necessitated by the world in which The Last of Us takes place. That concern was lifted, though, after the game’s opening scenes, which left me stunned throughout the entirety of the subsequent title sequence. It’s not the plot that makes this title so incredible, though. Though The Last of Us is a story-driven game, its story is completely character-driven. The game is not merely a series of events into which its protagonists are dropped; every decision feels genuine, every action true to the characters’ histories, motives, and development. The relationship between Joel and Ellie provides a lens through which to see this development; as the game and the world around them changes, so, too, do the characters. Two people who seem to be polar opposites attempt to find common ground, learning from one another and seeking salvation. It seems like the structure of a bad buddy cop movie (maybe even a good buddy cop movie), but nothing between them is forced. Through Ellie’s growth, we are offered a harsh glimpse into the realities of this world, while Joel’s past haunts him, hardening his inability to trust others. There is an obvious give-and-take here that–for better and for worse–the companions must undergo as they travel the country to complete a mission far more vital than their initial task. While much of the character development and story unfolds in cutscenes, Naughty Dog has brilliantly included small touches during gameplay to enhance the story’s verisimilitude. Bits of conversation heard as a passerby in the Quarantine Zones, Ellie’s verbal and physical reactions to the world around her, and viewable notes and artifacts make this world–and the characters in it–as real as can be. With superb voice acting, fantastic writing, and practically unparalleled audio-visual presentation, The Last of Us could easily be a non-interactive experience and stand as a great movie. Because of its outstanding gameplay mechanics, however, I hope never to see the game (or any potential sequel) fall victim to that fate. I think a large portion of the industry was afraid that this new IP was going to turn out to be “Uncharted with Zombies.” Nothing could be further from the truth. While the shooting and cover systems somewhat call to mind the adventures of Nathan Drake, the rest of the gameplay is unique and far more real. One of the most stark differences between Joel and other Naughty Dog protagonists is in his movement. Joel is a real-world man in his late forties; you won’t find him rock climbing, free-running, or platforming. He can sprint and vault over low-standing objects, but not a single one of his movements makes the player say, “There’s no way he can do that.” Likewise, despite his ability to handle himself, Joel is not a trained killer. His hand-to-hand combat is messy, can be countered by enemies, and even when it is successful, it’s brutal as hell. Stealth kills involve no quick-and-painless neck-breaking, as Joel instead fights to keep struggling enemies in his choke hold. To illustrate this point, a quick spin of the camera allows players to witness the moment when these enemies give up the exertion and succumb to blackness. Likewise, melee weapon kills are bloody and stomach-churning. Whether you’re hacking off the head an enemy soldier with an axe or bashing in the deformed skull of an Infected with a baseball bat, the amount of blood spurting forth creates (what I imagine to be) a disturbingly realistic image of fight-for-your-life violence. The Last of Us defies the Uncharted model in a number of other key ways as well. In a broader sense, the game comes with an omnipresent sense of desperation not found in Naughty Dog’s lighter titles. Extremely limited ammo, in-the-moment object collection and crafting and capable, coordinated AI all add to the palpable tension. This desperation, though, gives players the chance to get creative with their approaches to various situations. Sometimes painstakingly stealthing your way through an area makes more sense than ridding the world of your enemies, while other times the best option is simply to run away and hope not to get cornered. The best part of this is that–in the vast majority of circumstances–there is no “right” or even clear path to success. This allows for a good deal of experimentation, as well as upping the game’s replay value considerably. As could be expected from Naughty Dog (and this game in particular), multiplayer in The Last of Us has a great deal of uniqueness to it. “Factions” provides two modes of 4v4 matches, built around a clan-based progression system. Supply Raid Mode pits two teams against one another in a team-deathmatch setting with the additional objective of scavenging for supplies, while Survival Mode is slightly more precision-focused, with faster rounds and no respawns. One of the most surprising things about the multiplayer is in how true it is to the single-player game. Though part of a separate “story” of conflict between Hunters and Fireflies, the same raw violence, shortage of supplies, and necessity for calculation appear in Factions. Because of its (relative) off-the-beaten-path nature, I imagine the game’s multiplayer will not have too large of a community, but players seeking a new kind of competitive experience might just find a home with Factions. Until you’ve played The Last of Us, you’ve not experienced how purely visceral a video game can be. This gut-wrenchingly, heart-breakingly affecting title shows us the true capacity of the medium. The journey across this once-familiar, now-foreign setting forces you to go on an emotional journey into the darkest depths of the human spirit. The words “emotional rollercoaster” do not apply here, as the game’s “ups” are brief breath-catching moments that always carry with them a sense of foreboding. Therefore, if amusement-park metaphors need be employed, “emotional Tower of Terror” is far more apt. That said, the game somehow balances its darkness with a subtle, permeating sense of hope, which provides just enough drive to guide these characters through to the end of their story. At that point, no matter what else you feel, you’ll find the experience sticks with you long after the credits roll. The Last of Us was developed by Naughty Dog and published by Sony. A PlayStation 3 copy was provided by the publisher for reviewing purposes.